Technology has made it easier than ever to reach wider audiences no matter where they are in the world. All it takes is a little thinking outside the box and you can market a self-published book in creative ways, affordably and impactfully. This is where book tours come in: Tours are a great way to connect with your readers, and technology has made them easier and more cost effective than ever! 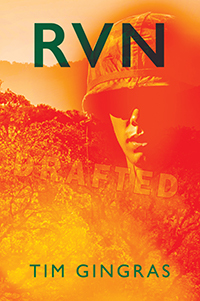 Author Tim Gingras is taking his latest book RVN, on tour — a Virtual Book Tour with Outskirts Press. This will allow Tim to take his book around the world, all from the comfort of his own home! Keep an eye out for Tim’s book as he will be featured on several blogs over the weeks and months ahead! Luckily for us, Tim was kind enough to answer a few questions as the tour was getting started so that we can give you a sneak peek into the mind of the creator of RVN. OP: Tell us a little bit about RVN. What is it about? Tim: It’s about a good Chicago kid, who gets drafted shortly after graduating High School, and despite options to avoid the call to serve, serves the best he can. It’s a story of survival. OP: Why did you decide to write this story? Tim: I had the concept of the story swimming around in my mind for over a decade, and since retiring, I challenged myself to write this story, using everything I have learned, researched, imagined, and lived. OP: How did you get your book published? Tim: I made my best decision contacting Outskirts Press. They guided me and inspired me. OP: What types of readers would be interested in this story? Tim: Veterans. War story readers. Students wanting to learn more about the Vietnam experience. Romantics, and patriots. OP: What is special about your book? Tim: Time will tell. I think it’s a simple novel, yet I wanted to research as much of the tangible parts, such as the weather of the day, and what was going on in Charlie Kinane’s world. A great summer in Chicago, 1966, just before induction. I tried really hard to describe surroundings, and situations as realistically as possible. Every quarter, 15% of my Royalties from each book will go to hard working Veteran Organization. OP: What differentiates it from other books in the same category? Tim: I was a U.S. Navy Corpsman. My Navy C-School was Pharmacy at Portsmouth Naval Hospital. I tried to create a REAL character in Charlie Kinane, dealing with a very complicated, and dangerous experiences, in the best way possible. It’s a quick read too, not too long. OP: Have you published any other books? Tim: This is my first novel, though I have written performed material. OP: Do you plan to publish more? Tim: I hope so, but I’m going to see how this turns out. I have a couple more stories swimming around in the old grey matter still. OP: Thanks for your time, Tim! We look forward to learning more about you as you visit other bloggers! First time author, Tim Gingras, is a U.S. Navy Corpsman veteran. 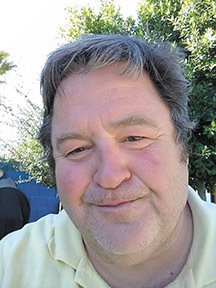 After serving honorably for 4 years during late 1970, and further education, Tim spent many years in Chicago Theaters, performing Stand-up, Film, Commercials, and hosting many Chicago events with City of Chicago. All while having a successful full-time career in Banking. After 9/11, Tim pursued work with Federal Government, and spent several months in Iraq War-zone, as civilian contractor during 2004. Tim retired from U.S. Department of Veterans Affairs, after working in all three branches. He lives in Phoenix. This author purchased the Virtual Book Tour marketing option, which allows self-publishing authors to connect with bloggers and harness the power of the blogosphere by taking their book on the “virtual road.” Learn more about this service by visiting your Publishing Center and reviewing the available marketing options. Are you an author looking for help to market your self-published book? Shattered Dreams at Rainbow’s End by Christopher Horne, Ph.D.
Technology has made it easier than ever to reach wider audiences no matter where they are in the world. All it takes is a little thinking outside the box and you can market a self-published book in creative ways, affordably and impactfully. This is where book tours come in: Tours are a great way to connect with your readers and technology has made them easier and cheaper than ever! Author Christopher Horne, PhD is taking his latest book Shattered Dreams at Rainbow’s End, on tour — a Virtual Book Tour with Outskirts Press. What this means is that Christopher will get his book into the far corners of the globe, all from the comfort of home! Keep an eye out for Christopher’s book as he will be featured on several blogs over the weeks and months ahead so keep your eyes peeled to learn more about him and his book. Luckily for us, Christopher was kind enough to answer a few questions as the tour was getting started so that we can give you a sneak peek into the mind of the creator of Shattered Dreams at Rainbow’s End. OP: Tell us a little bit about Shattered Dreams at Rainbow’s End. What is it about? 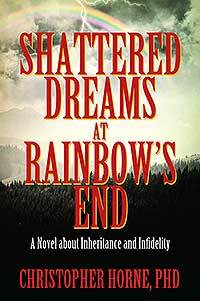 Christoper: Shattered Dreams at Rainbow’s End is a real-life story of a World War II hero. The hero dies tragically leaving his widow vulnerable and in despair. His children shatter his dream with their greed, corruption and infidelity. The tragedy in Shattered Dreams is not just the multifaceted drama surrounding the widow’s three husbands but the breaking of at least one rule in the ethical and moral code for inheritance and family by each of his children and their accomplices. Christopher: I wrote this book to honor a forgotten World War II hero who dreamed of family values: honor, loyalty, integrity, and love. His dream was shattered by difficult life choices made by his wife and family, resulting in tragedy and triumph. I have tried to include some hard lessons learned in the process. So often, others have said or written what we wish we had the skill to state. Still, we must have the courage to try, and this is what I have done. We live and learn! Christopher: I chose an on-line self-publishing company, Outskirts Press. Christopher: Females between the ages of 27 and 85; psychologists, pastors, ministers, Christian counselors and World War II buffs. Christopher: The novel incorporates a dying father’s wishes for the family farm with his widow’s subsequent marriages and unethical and immoral family practices aided by legal corruption. The book ends on a very positive note, inserting “lessons learned” relating to the issues discussed. Christopher: The book is based on a real-life story- informative historically, psychologically and legally. Christopher: Currently, I have not. Christopher: Currently I do not plan to publish another book. OP: Thanks for your time, Christopher! We look forward to learning more about you as you visit other bloggers! Christopher K. Horne, PhD, is the author of his first novel. A University professor, entrepreneur and writer and a native of North Carolina, he has visited or worked in more than 13 countries.